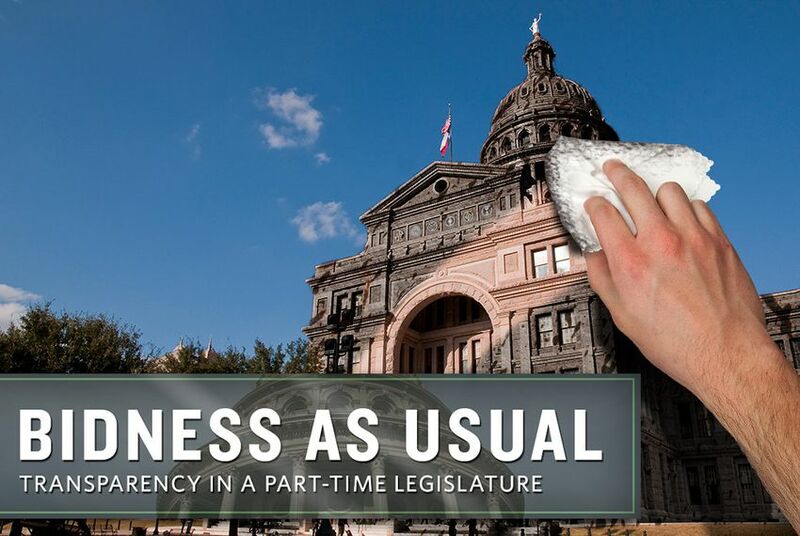 With a conflict disclosure system rife with holes, virtually toothless ethics laws often left to the interpretation of the lawmakers they are supposed to regulate, and a Legislature historically unwilling to make itself more transparent, Texans know exceedingly little about who or what influences the people elected to represent them. And they have no way to differentiate between lawmakers motivated entirely by the interests of their constituents and those in it for their own enrichment. 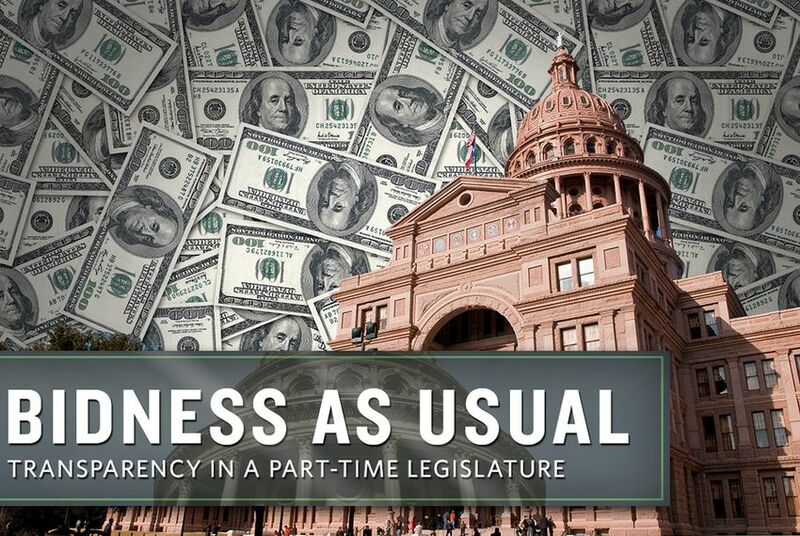 The Texas Tribune’s Bidness As Usual Project — an extensive reporting and data venture that spanned the 2013 legislative session — looked at these lawmakers and the ethics rules that govern them, addressing issues like conflicts of interest and breaches in public accountability. 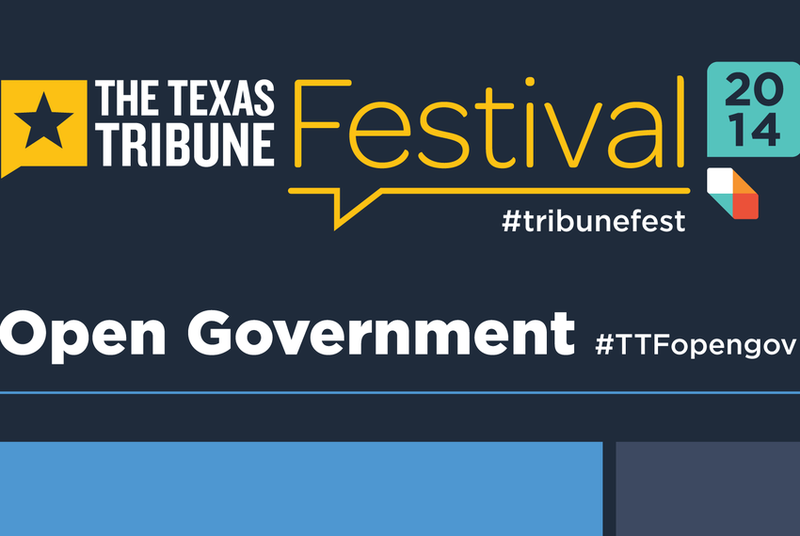 In addition to dozens of stories analyzing everything from individual lawmakers’ personal interests to the state’s disclosure forms and ethics laws, the project included the Texas Tribune Ethics Explorer. 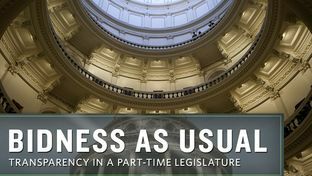 This interactive tool was designed to educate citizens on the degree to which legislators’ personal interests conflicted with the public interest when passing bills and setting policy. 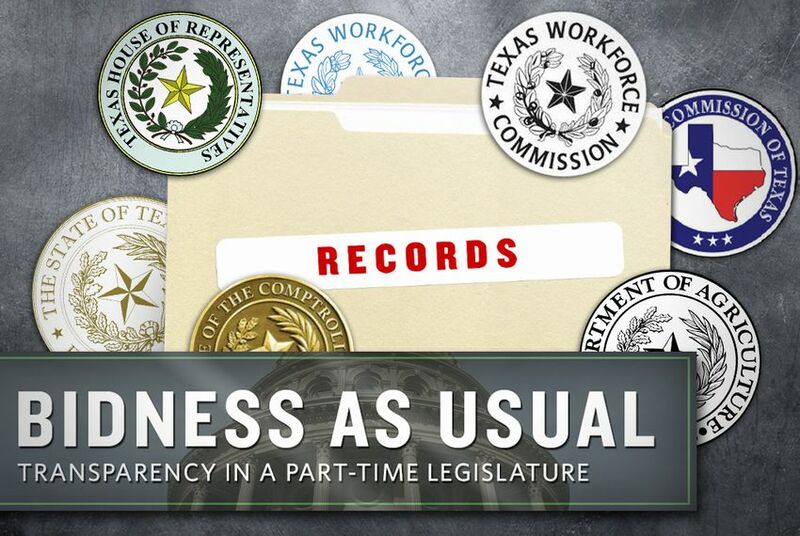 It included extensive research into all 180 members of the Texas Legislature, plus the governor and lieutenant governor, and provided details on a lawmaker’s employment history and financial records, stock holdings, property listings, campaign finance data and ethics investigations. The Explorer was created with the generous support of the Fund for Investigative Journalism. 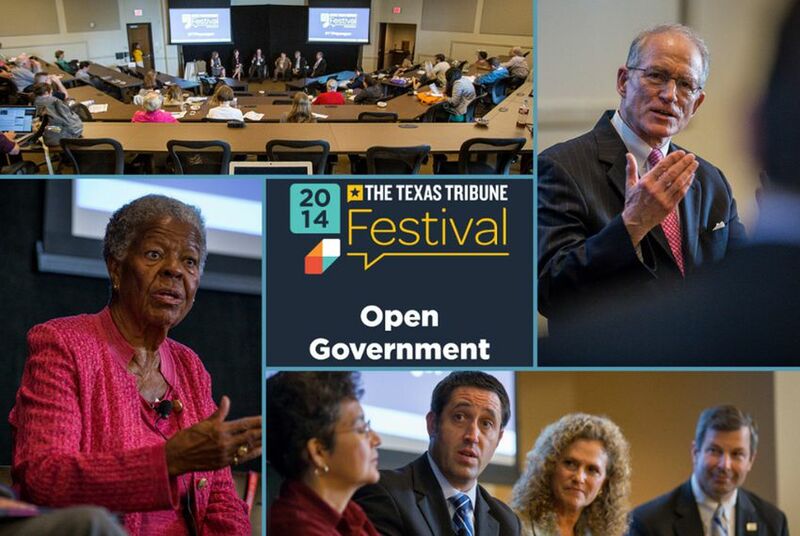 We're liveblogging the sessions from the 2014 Texas Tribune Festival's Open Government track. 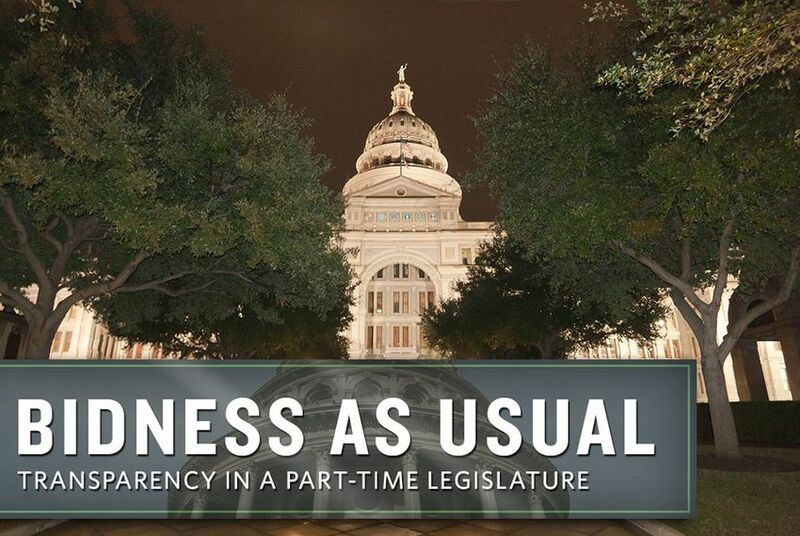 The sessions include panels on disclosures by legislators, open records in Texas, transparency and the Texas budget, and the issue of donor privacy. In the great-news-to-wake-up-to department, we've been honored by Investigative Reporters and Editors with the "Gannett Award for Innovation in Watchdog Journalism" for our livestream, our Ethics Explorer and our Bidness as Usual series. 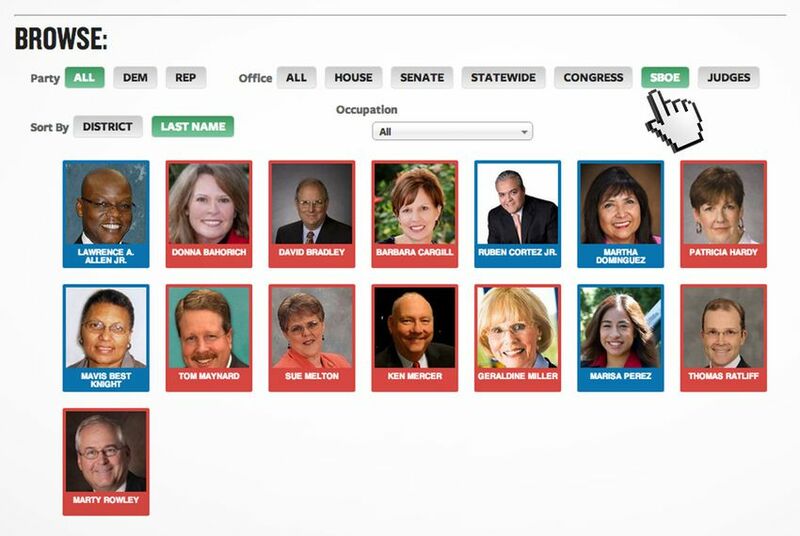 We've expanded the officials in our Ethics Explorer to include the judges on the Texas Court of Criminal Appeals and the members of the State Board of Education. 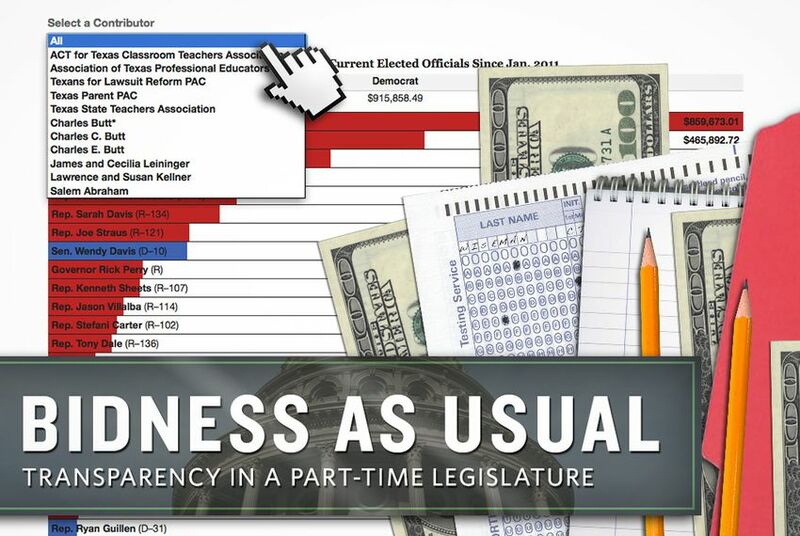 We've also updated our existing analysis on members of the Legislature. 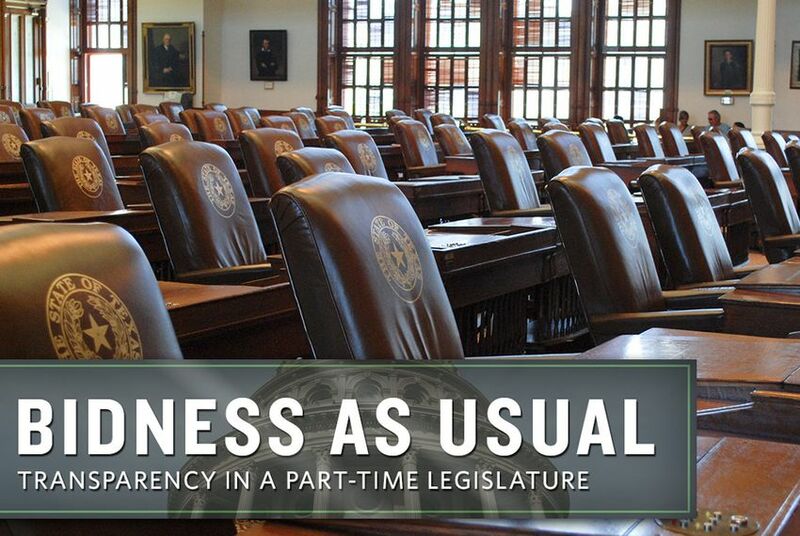 A vote by the Texas Legislature to raise state district judges' salaries will benefit lawmakers whose state pensions are based on the judges' salaries. Among those benefiting are 10 members of Texas' congressional delegation. 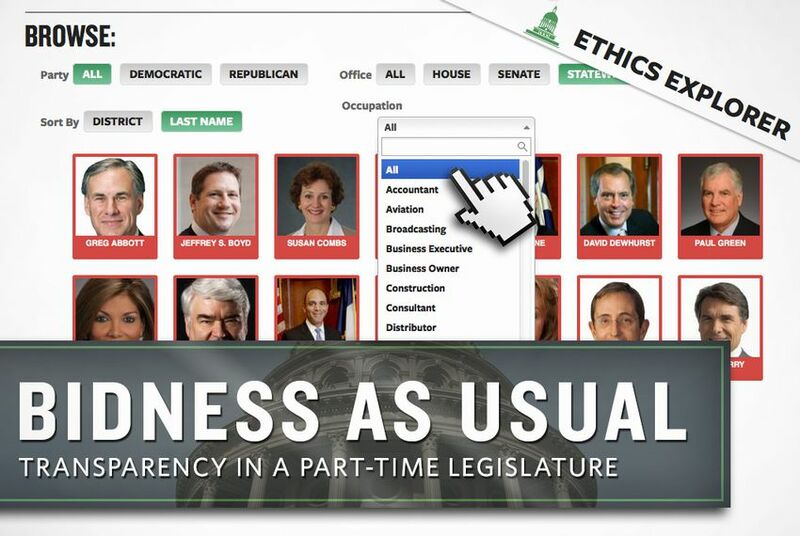 Over the course of the 83rd legislative session, we produced more than 60 articles on ethics and transparency among the state's elected officials. We've turned the "Bidness as Usual" project into a free e-book. 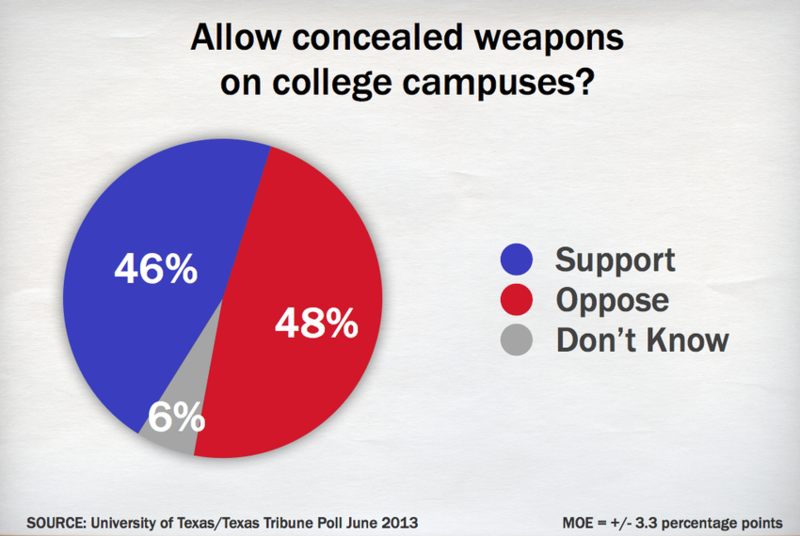 Texans strongly favor criminal and mental health background checks on all gun sales, and they are divided when it comes to concealed weapons on college campuses, according to the latest University of Texas/Texas Tribune Poll. It doesn't feel much like there's a special session going on at the state Capitol, but that doesn't mean taxpayers won't get a bill for it. 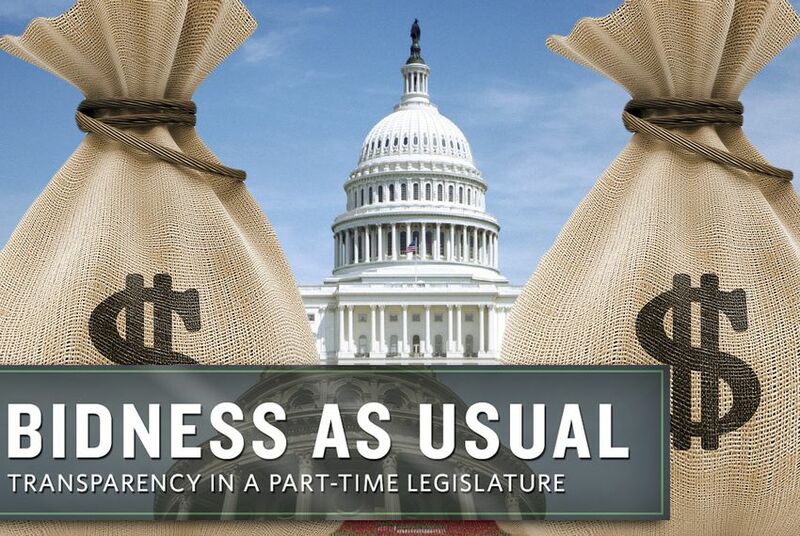 Lawmakers get paid whether they're here or not. 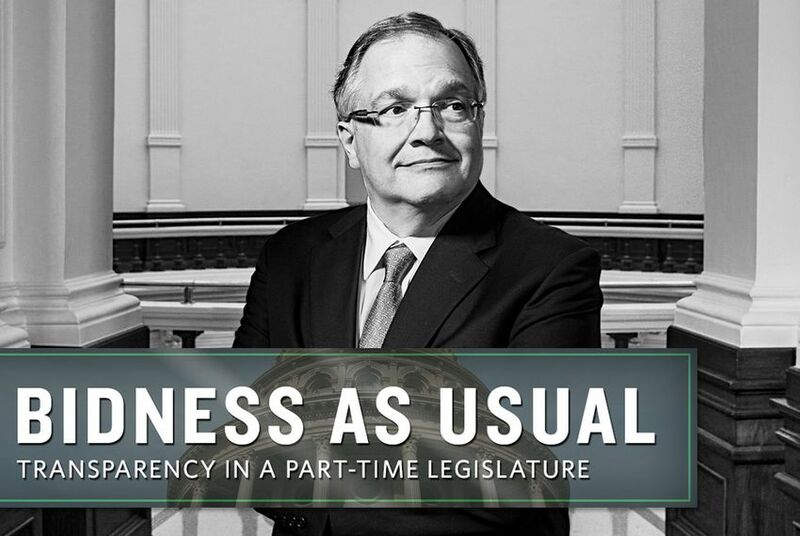 When it came to passing major ethics reforms that would have increased transparency for elected officials, the 83rd Legislature didn't make much headway. Lawmakers, it seems, didn't have the appetite for increased public disclosure. Whether they have a longstanding interest or are branching into new territory, some of the state's top political donors advocate for education issues. 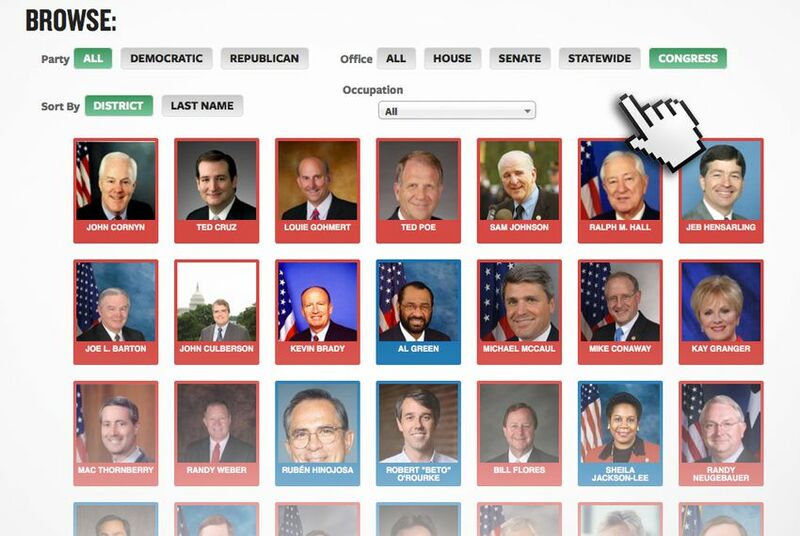 Use our interactive to track contributions to lawmakers who make decisions affecting Texas schools. End-of-session dinners are commonplace for legislative committees at the end of the session, and they can be lavish affairs. One this week cost more than $22,000. Sen. John Carona remains a political maverick in the Texas Legislature, willing to stand alone in policy fights and raise money for Democrats, despite conservative grassroots pressure to conform to stricter ideology. From protecting endangered lizards to changing industry standards on fracking, energy and environmental groups have many competing interests in Texas. Use this interactive to track campaign contributions by some of the most influential such groups and donors. UPDATED: State Rep. Jason Isaac, R-Dripping Springs, again attempted to add a measure decoupling legislators' pensions from judges' pay. But the amendment to Senate Bill 1459 was defeated Tuesday. Many of the residents of Sun City Shadow Hills near Palm Springs say they're being overcharged and hit with unfair penalties by their HOA. They have the company run by state Sen. John Carona, R-Dallas, in their crosshairs. 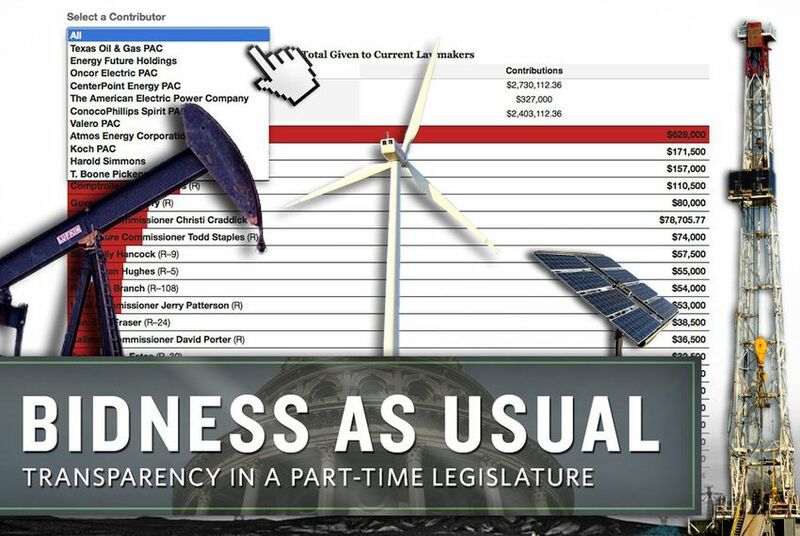 UPDATED: Facing a laundry list of record votes, lawmakers tacked on several amendments to an Ethics Commission reform bill on Monday that would strengthen the disclosure rules that govern them and their contributors. 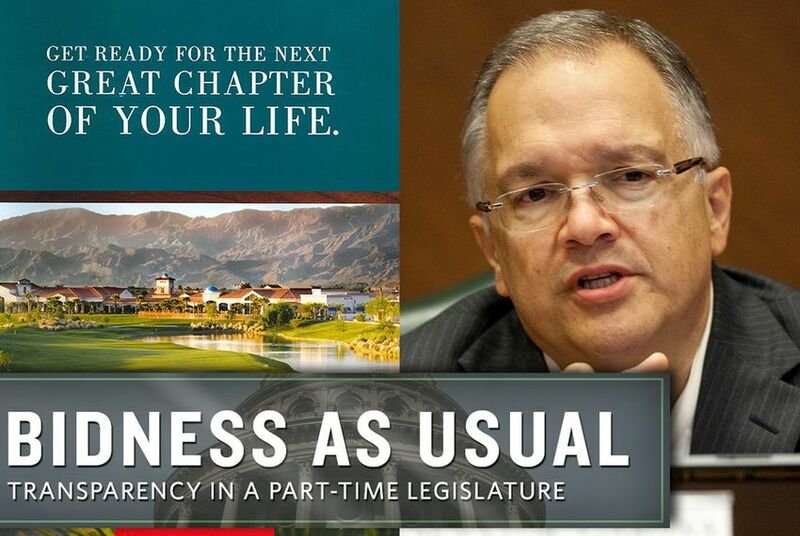 The constitutional provision of a part-time Legislature whose members have full-time jobs back home blurs the line between public responsibilities and personal ambition — as the story of a certain powerful state senator illustrates.